Italians started to vote on Sunday in a referendum on constitutional reform which will decide the political future of Prime Minister Matteo Renzi, who has promised to resign if he loses. 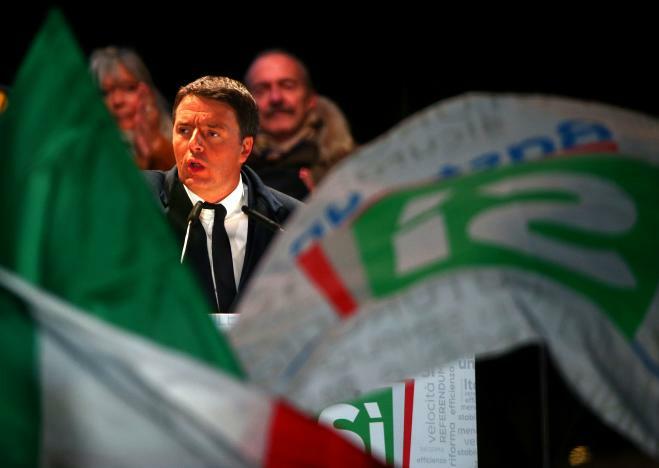 Financial markets and Europe's politicians fear victory for the opposition 'No' camp could trigger political instability and renewed turmoil for Italy's battered banks, pushing the euro zone towards a new crisis. Polls opened at 7 am (06.00 GMT), with about 51 million Italians eligible to vote on Renzi's plan to drastically reduce the role of the upper house Senate and claw back powers from regional authorities. With all the opposition parties lined up against the reform, a victory for Renzi would be a surprise and represent an enormous personal triumph for Italy's youngest prime minister who often appeared to be fighting the campaign single-handed. All surveys published in the month before a blackout was imposed on November 18 put the 'No' camp ahead. Private polls have continued to be conducted in the last two weeks and bookmakers say 'No' remains the clear favorite to win. However, in the final days of frenetic campaigning Renzi insisted the public mood was changing, focusing his attention on the millions of Italians who said they were undecided. Pippo Nicosia, a stall-holder at Campo dei Fiori market in central Rome, said he would vote 'Yes' but had no doubt about the result. "'No' will win, everything will collapse so we might as well all go on holiday," he said. Turnout, expected at between 50 and 60 percent, could be crucial. Pollsters say lower participation could favor Renzi, as hostility to his reform is strongest among young voters and those in the poor south, segments of the population that often don't bother to vote. A turnout above 60 percent could also make the result more unpredictable, as it would suggest many voters who said they planned to abstain ended up going to the polls. With bookmakers' odds suggesting a roughly 75 percent chance of a win for 'No', speculation is rife on what Renzi will do in the event of defeat. He is widely expected to resign and has said he will play no role in any unelected, "technical" government, which President Sergio Mattarella may try to put in place. Some of his allies have urged him to stay in power regardless of the result. The result of exit polls will be announced as soon as voting ends and the count begins at 11 pm. After around 30 minutes, the first projections of the result will be announced on the basis of actual votes counted. If the result is not close, the winner could be clear after the second projection, some time between midnight and 1 am (00.00 GMT). In a very close race, the winner may not be known until the count is completed, probably between 2 and 3 a.m.
Economy Minister Pier Carlo Padoan sought to calm nervous markets on Friday, saying there was "no risk of a financial earthquake" if 'No' wins, though there may be "48 hours of turbulence". Market jitters have concentrated on Italy's banks, saddled with 360 billion euros (US$380 billion) of bad loans, and most specifically on Monte Dei Paschi di Siena, its oldest and third largest lender. The bank needs to raise 5 billion euros (US$5.3 billion) by the end of the year to plug a capital shortfall or risk being wound down. Government officials say potential investors may be deterred by political instability if 'No' should win.